Rishon Lezion court extends remand of Sheikh who praised terrorist murder of 2 policemen on Temple Mount. 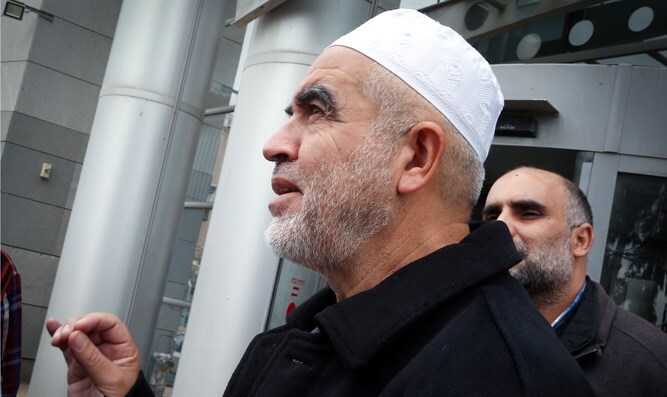 The arrest of the leader of the illegal Northern Branch of the Islamic Movement, Sheikh Raed Salah, was extended until Thursday by the Rishon Lezion Magistrate Court. Salah was arrested early Tuesday morning at his home in Umm al-Fahm, Palestinian Authority media reported. His arrest followed interviews he gave with three Arab broadcasters after the murder of two policemen on the Temple Mount last month. Salah praised the terrorist's actions and called them shaheeds (martyrs). He is also suspected of other acts of incitement to violence and terrorism. Salah was sentenced to 9 months in prison last year for incitement to violence and racism over an inflammatory sermon he delivered in Jerusalem. He has served other prison terms for similar offenses. Born in Umm el Fahm, the Israeli Arab town from which the policemen's murderers came, he served three terms as its mayor..
Public Security Minister Gilad Erdan responded to Salah's arrest by saying: "Instigator Raed Salah led a movement that was outlawed because of its extremist ideology. It caused acts of murder and terror. It was not for nothing that I advanced the outlawing of his movement." Erdan continued, "Salah expressed himself in a way that encourages extremism and displays empathy with violence and acts of murder, and therefore he constitutes a danger to the public. I hope that this time he will be brought to justice and be sent for an extended time behind bars."